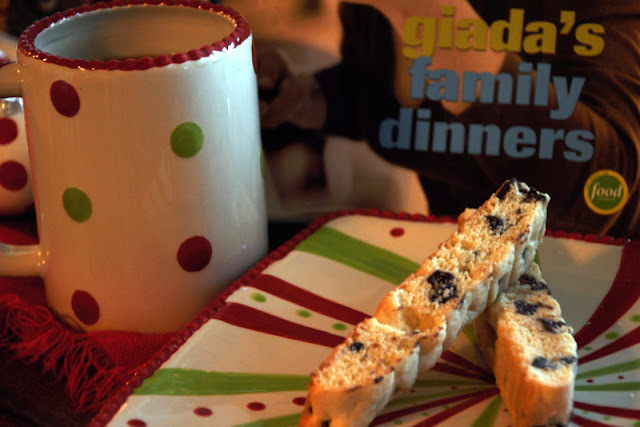 I've only recently become a lover of biscotti (both the cookie and just saying it out loud as Giada does). I must confess to a preference for Nonni's chocolate hazelnut available on the end isle of the local grocery store but once a certain three year found grandmas hidden stash, I quickly discovered that at nearly four dollars for eight of these yummy coffee dippers I would soon go broke. 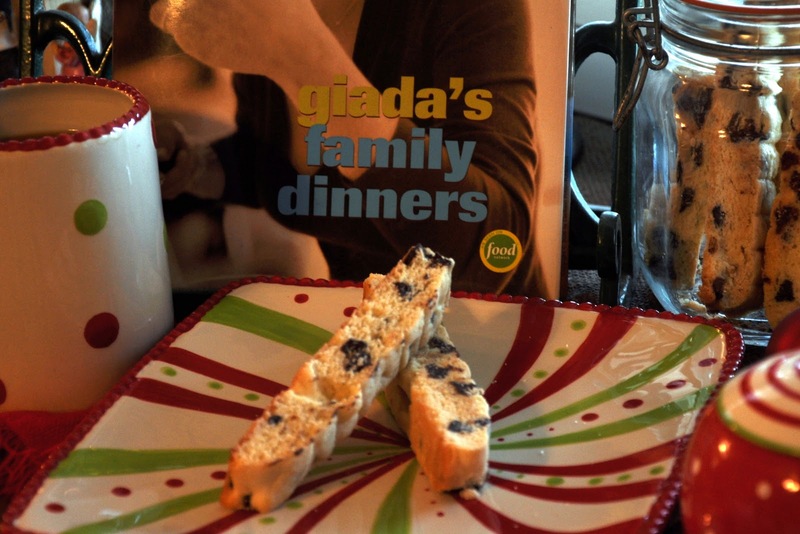 So this weekend I pulled out my Giada De Laurentis cookbooks and found a very delicious and simple recipe for chocolate chip anise biscotti. Since I didn't have any anise seeds in my spice basket (and am not familiar with what flavor they add), I left them out and made chocolate chip biscotti (because I am only too familiar with the flavor of chocolate chips). I don't think I shall ever go back to store bought...these are absolutely yummy. Like very grown up and sophisticated chocolate chip cookies. Just perfectly crunchy and perfectly dippable and perfectly delicious. I found the recipe in this cookbook but I also searched and found her recipe for holiday biscotti here. I have a full pot of coffee and a canister of these yummy things to share. Won't you join me? I'd love to! They sound delicious! My Dad used to get biscotti at the Italian store near our home in Pasadena...this brings back good memories!! Hi, Anise seed have a mild licorice flavor. I think your biscotti looks delicious and I'd prefer them without the anise flavor. Now I'm craving a biscotti and coffee, but dare not. It's way too late to have either. Rats. They look delicious and I'd love to join you. Mmmm, I would love to! I love those Italian cookies!!! I buy the big tub of Nonni's at Sam's Club. So good!!! Yours look even better!! Okay I am coming right over. Up early with Quinn who has the cold my other girls gave her. So is 5:00 am too early? Love you sweet lady and hope you have a very Merry Christmas! 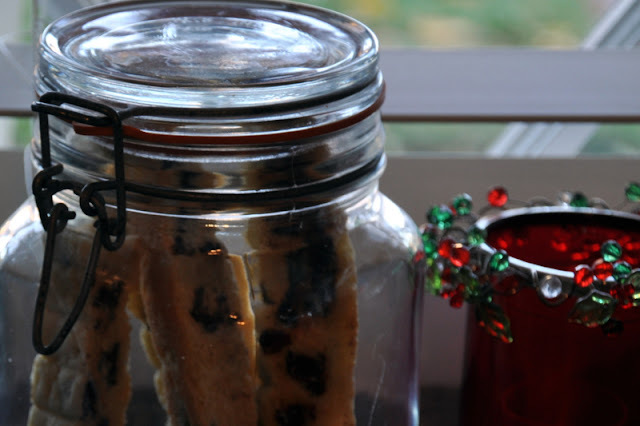 Biscotti is one thing that I haven't made before. Sounds like I should give it a try . 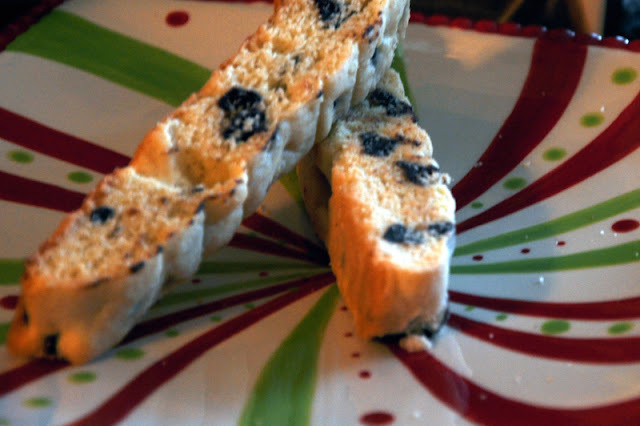 You know, I have never tried biscotti before, although I heard that they are good. Your chocolate chips ones look delightful. I hope you're enjoying the Christmas season as much as I am. I sure will! I have been thinking about making some myself. You know how much I love my coffee.